anuary 30th, 2005: Warm again - it only got down to about —8° last night. There was a strong south wind yesterday and last night, but it calmed down by this morning. We might actually see some sunshine today. It’s been warm all week, except for a couple of days that were about normal, and the outlook is continued warm weather for the rest of the week. 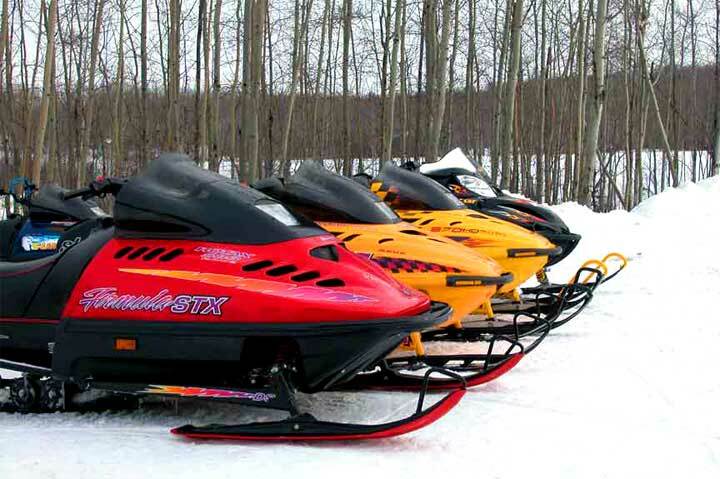 The trails are in good shape, and snowmobiles started showing up Friday evening. Porcupine had a rally yesterday so it was fairly quiet at the Park, but today there are lots of them around. Quite a few people have mentioned knowing someone who would normally have come to Greenwater to snowmobile, but went elsewhere because they can’t buy gas here. I expect the Cove being closed has had a dramatic impact on the number of people visiting the Park over the winter. We were surprised to see a big pile of firewood in the middle of the Cove’s parking lot the other day. I spoke to Andy Renaud of Renaud Realty and he said a trailer broke an axle and had to unload. It was all gone by this weekend. 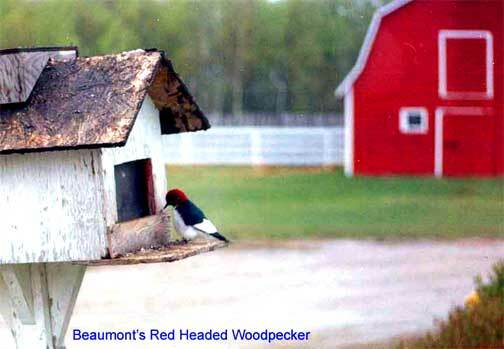 Beaumonts brought some photos they took of a red headed woodpecker at their bird feeder last summer. They only saw them once, and had to take the picture through their kitchen window, but there’s no doubt about what kind of bird it is. According to our bird book, south-eastern Saskatchewan is the extreme edge of their range. Talk at coffee was the cost of medicare, and how we take it for granted. I wonder if it would be outrageously expensive to send patients a notice after every doctor or hospital visit, telling them what the cost of the visit was, and how it was paid. Would people respect it more if they knew the cost? I am having cataract surgery tomorrow, and haven’t a clue what the cost will be. The surgery itself is apparently only about ten minutes, though I’m in the operating room for an hour, but there have been two preliminary visits to the surgeon for assessment and measurement, and there will be at least one visit afterwards. Would it make any difference if I did know the cost? I might put it off a bit longer and be more of a hazard on the highway than I normally am, but unless I die in the meantime the surgery will have to be done eventually. Artificial lenses should mean fewer trips to the optometrist for the rest of my life, but again, I don’t know what that means in dollars. We went to Porcupine Plain and Tisdale on Tuesday, but we didn’t enjoy it. From here to Porcupine, the highway was wet, but not icy; in town, though, the sidewalks were sheets of ice and we realized there had been a freezing rain. We assume our highway crew had been out early in the day and applied salt, while the temperature was still high enough for the salt to work. West of Chelan, though, there was no sign of any salting or sanding, and the highways were terribly icy all the way to Tisdale. We crept along at 80 km/h or less and had no problem, going or coming. No sign of any vehicles hitting the ditch, either. Coffee was at our place on Monday and Thursday, and there were about nine of us. What a wonderful visiting time! We covered local history and current events and manage to find solutions to most of the world’s major problems. I suppose we should be keeping a record of proceedings for the edification of future generations, but nobody ever seems to have a pen. We got a phone call from the Park Office yesterday, telling us that dredging of the marina will start on February 2nd. They will fence off the area on Monday, and the phone call was to warn the permanent residents to steer clear of the area. The caller didn’t know what kind of equipment was going to do the job, but rumors last fall were that they were waiting until the ice froze solid to the bottom to support the equipment. Sounds like a big trackhoe to me. Boaters will be happy.